Tonight ChefConf 2014 kicks off at the San Francisco Hyatt Regency, and my fellow ¡Elasticos! and I are very excited to have the opportunity to share the vision and reality of ElasticBox with the attendees. We’ll be showcasing how our approach to DevOps allows you to integrate easily and seamlessly with Chef one time regardless of how many different cloud providers you may use. Configure the platform and app with Chef, deploy and manage it with ElasticBox. Yes, that’s right…there’s no longer a need to rewrite/modify/debug essentially the same Chef scripts over and over and over just to deploy an application on a different cloud service. On a more technical level, what ElasticBox does is abstract away the need to perform API level integrations on a per provider basis, and this abstraction allows you to leverage Chef uniformly across providers. Furthermore we do this for the entire service/application, not just for individual nodes. ElasticBox allows you to deploy an entire enterprise application holistically using the power of Chef to any cloud provider. You can now essentially leverage Chef scripts as a service! Now, of course that’s not all ElasticBox does. Our overall mission is to make it as easy as possible to develop, deploy and manage applications on any cloud infrastructure. To do that, we’re pioneering a simplified, modular, service-based application development structure, where fully configured components of application architecture are encapsulated as “Boxes” and made available as a service. Also pretty cool, yeah? 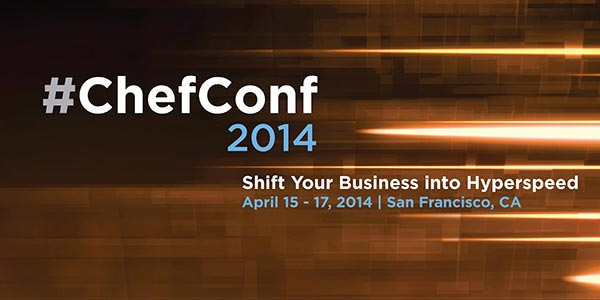 Come see us at ChefConf 2014 where we are a silver sponsor. Stop by booth 216 and see how ElasticBox brings Chef to the Cloud. I am sure we are giving away t-shirts or gum or something. Thanks Chef for hosting this event – this is all very exciting stuff.